With fire damage costing the South African economy a figure of R3.1 Billion annually, what better way to combat this with affordable, up-to-date, hand-held fire extinguishers? Government has put extensive legislation in place to help mitigate the risks posed by fire and very few business leaders realise that all buildings are required to have fire extinguishers, in addition to any automatic sprinklers or other fixed equipment that may also exist. Specifications are laid down by the South African Bureau of Standards and enforced by the South African Qualifications and Standards Committee. 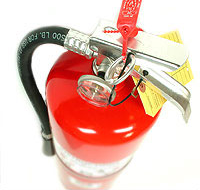 Fire extinguishers are easy to forget about, which is why we are the ones you need! We would be happy to help you out – no matter the occasion. It’s easy to have fire extinguishers present. However – when you need them, they have to work and that’s why the legal requirements are so stringent. Our new and refined Rent-a-Xtinguisher service is a great opportunity to add value to our clients by helping them to comply with the law, as well as prevent unnecessary loss of life or property in the event of a fire.